Sutton, Marketing Manager and Elite Clinician, becomes the first Vice President ever named at Fitter and Faster. [Anaheim, CA. September 4, 2018] — Chloe Sutton has a long history of achievement with Fitter and Faster. She has played a significant role in the company’s evolution and success. Sutton’s very first Fitter and Faster clinic was in September of 2010 when she just just 17 years old. No other person has worked as a clinician for Fitter and Faster before their 21st birthday. Since day one, Sutton has brought a high level of creativity, initiative, professionalism and success to the company. As a young professional, Sutton understood the importance of being an attentive, thoughtful clinician to help all participants improve. She took the initiative to study the styles of other clinicians; watch countless videos of competitive swimming lessons; ask questions; read survey results and more. Sutton created her own fun, engaging teaching style and continues to study her craft as a clinician. 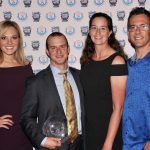 A few years after starting as a clinician with Fitter and Faster, Sutton began handling various marketing responsibilities for the company including social media and helping to promote clinics. In April 2017, Sutton took on a full-time role with Fitter and Faster as Marketing Manager. Her achievements include assisting with the direction and production of the company’s popular Swim Video on Demand service; helping to launch the company’s new website; and creating processes for improving the marketing of our clinics. In recent months Sutton has taken on an even more strategic role with the company – resulting in the highest level of participation and positive customer reviews in the company’s history. 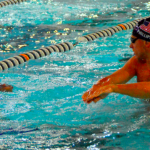 “Creating clinics that competitive swimmers of all ages and abilities want to attend multiple times each year requires creativity, attention to detail, and a dedication to exceeding expectations. Chloe takes all challenges head-on. Sometimes she will engage with an important project with with little to no previous experience and come out with top-level results. She is warm to customers, vendors and everyone else she comes in contact with. She exemplifies what the company stands for. I’m proud to welcome her to the Executive Team and make her the highest ranking full-time employee we’ve ever had,” said David Arluck, President and CEO. Sutton and Arluck will be at the Fitter and Faster booth at the American Swimming Coaches Association Conference this week from Wednesday through Saturday in Anaheim, California. Chloe Sutton is a two-time Olympian and was the first swimmer in US History to qualify for the Olympics as an open water swimmer and in the pool. In 2006, she won her first international medal by winning the open water 10k at the Pan Pacific Championships as a 14 year old. Fitter & Faster Swim Tour is the premier elite level swim clinic and swim video operation in the United States. The company’s mission is to provide fun learning experiences for competitive swimmers of all ages and abilities in person and online. Since 2009, FFT has produced in excess of 1,000 clinics in 40 states and Canada. More than 125,000 swimmers, parents and coaches have attended our clinics. Almost 100 elite level swimmers including 50+ Olympians & Paralympians who won more than 100 Olympic & Paralympic medals have led Fitter and Faster clinics.